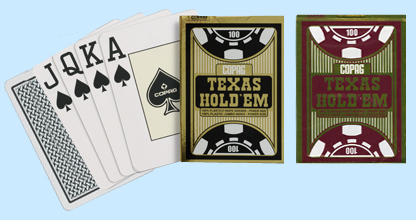 These 100% Plastic Texas Hold’Em Copag Playing Cards feature super index numbers and pips. Each Copag Texas Hold’Em Playing Cards Set features one black and one burgundy deck. For additional information or wholesale pricing on Plastic Copag Texas Hold’Em Playing Cards, please call 1-800-233-0828.